Sea level rise isn’t just a problem for coastal cities, it’s a problem for NASA. 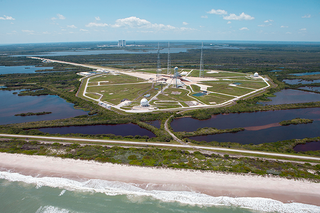 Two thirds of the space agency’s infrastructure, including the Kennedy Space Center, the Ames Research Center, and the Johnson Space Center stand between 5 and 40 feet (2 to 12 meters) above mean sea level. By the end of the century, billions of dollars of NASA assets could be underwater. Global mean sea level has risen 8 inches since 1870, and the rate of rise has doubled over the past few decades. A few weeks back, a team of climate scientists announced that the Earth is probably locked into ‘at least’ three feet of sea level rise due to melting icecaps and thermal expansion of ocean water as our planet heats up. NASA, which happens to be conducting much of this important sea level rise research in-house, is naturally quite curious (and worried) about how these trends will impact spaceflight and its scientific laboratories. The maps below, released along with a detailed NASA feature article, show the regions around NASA space centers (in red) that would be inundated by 12 inches (30 cm) of sea level rise. According to NASA, all of its coastal centers (shown on the map of the continental US below) are projected to experience at least five inches of sea level rise between now and 2050. There’s a good reason that NASA built so much of its infrastructure along coastlines: It’s the safest place to launch rockets from. The US government decided long ago that it would much rather have a rocket fail over the ocean than over a densely populated metropolitan region. Seems wise. But that well-intentioned decision has created some stark realities in the era of rapid climate change. For one, the only facility in the country that can launch crewed flights — NASA’s famed Kennedy Space Center in Florida — has found itself directly in the line of fire. Historical records and aerial photos indicate that the beach in front of Kennedy has thinned and moved inland by approximately 200 feet (60 meters) since the facility opened in 1961. Other launch centers, including the Wallops Flight Facility in coastal Virginia, have spent the last few years watching their beaches erode into the ocean in the wake of several large hurricanes. Of course, NASA doesn’t just plan to sit by as precious and one-of-a-kind facilities go underwater. The space agency’s Climate Adaptation Science Investigators Working Group is busy translating international climate reports, such as those published by the IPCC, into regional-scale projections and advice for individual NASA facilities. Moving forward, NASA scientists and managers will redouble their efforts to work with city and state officials to fortify coastlines. In some places, the answer will be smarter buildings, in others, retrofitting and hardening old infrastructure. Launch facilities that must remain shoreside will need to start accounting for costly beach replenishment and seawall repair as part of their routine maintenance. But if the worst-case sea level rise scenarios come to pass, NASA scientists— like many other coastal populations— may simply have to accept the inevitable, pack their bags and move inland.